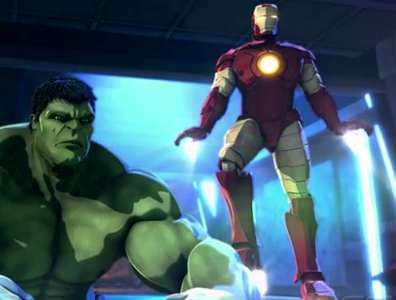 Over the last week or so word has got out that 'Brain Zoo Studios' have partnered up with 'Marvel Television' on an all-new animated feature, entitled, 'Marvel’s Iron Man & Hulk: Heroes United'. Now if you want to know more about this groundbreaking comic book project, please check out this news-release sent to me by those two crazy cats that are in charge of this climactic yet cinematic cartoon. 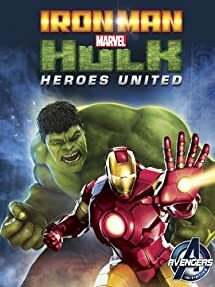 'Brain Zoo Studios' is proud to partner with 'Marvel Television' on their first animated feature, 'Marvel’s Iron Man & Hulk: Heroes United'. This story brings together not only two popular Marvel Super Heroes but a collaboration between Brain Zoo and Marvel. 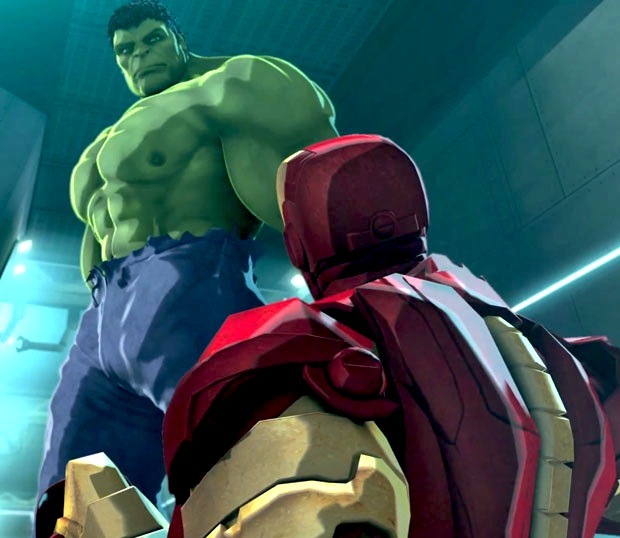 In order to maintain the true comic origins of these Heroes, Brain Zoo Studios and Marvel Television developed a technique that allowed for more robust animation and visual effects that enhance the film’s action-packed sequences without diverging from the “2.5D” style. Specialists in storytelling and character animation for over 18 years, Brain Zoo has been a proponent of the use of CG and the possibilities it opens up to effectively communicate key elements of a story. In Marvel’s Iron Man & Hulk: Heroes United, they provided input on shots to create the best visual story possible. With thousands of hours of animated entertainment under their belt, done in a variety of formats, Brain Zoo Studios has developed a robust pipeline, learning what is important to each format, adapting and honing optimization skills, all of which is built into their entire animation process. “Working with Marvel has been so fun and exciting for us. We’re proud that they chose us as a partner to work on this animated feature”, said Mo Davoudian, Founder and President of Brain Zoo Studios. “For any animation studio, it’s a dream to get to work with great characters and strong franchises such as Iron Man, the Hulk and the Avengers! With that comes the responsibility to deliver quality work that lives up to such a legacy. In the end, our mission is in line with Marvel’s - to make fun, entertaining stories”. In Marvel’s 'Iron Man & Hulk: Heroes United', The Invincible Iron Man and the Incredible Hulk join forces to save the Earth from its greatest threat yet! When two Hydra scientists try to supercharge a Stark Arc Reactor with Hulk's Gamma Energy, they unleash a being of pure electricity called Zzzax - and he's hungry for destruction. Together, Iron Man and Hulk are the only force that stands in the way of Zzzax's planetary blackout. But first the super heroic duo will have to get through snarling Wendigos, deadly robots and the scaly powerhouse, Abomination. Can two of Marvel's mightiest heroes find a way to work together without smashing each other before time runs out? "We're very excited for the release of Marvel Animation’s first long form CG animated feature”, said Eric Radomski, Marvel’s SVP of Animation Production and Creative Director. “This film represents a milestone in today’s animation landscape considering that the entire production was created and produced in Los Angeles, a true testament to our strong creative partnership with Brain Zoo". Brain Zoo Studios is an Emmy® Award winning computer animation studio and content creator based in Los Angeles. Brain Zoo Studios’ original IP, Pepe & Lucas has won several awards and is also an iBook. Since its inception in 1995, Brain Zoo Studios has consistently raised the bar in animation and visual effects for feature films, television, DVDs, commercials and video games. Client roster includes: Disney, Marvel, Mattel, Sony, Fox Sports and National Geographic. Notable game industry clients include: Activision / Blizzard, Electronic Arts, SCEA, Lucas Arts, Capcom, Sega, Epic Games, Microsoft, THQ, Bethesda and Namco-Bandai, among others. Marvel Entertainment, LLC, a wholly-owned subsidiary of The Walt Disney Company, is one of the world's most prominent character-based entertainment companies, built on a proven library of more than 8,000 characters featured in a variety of media over seventy years. Marvel utilizes its character franchises in entertainment, licensing and publishing.